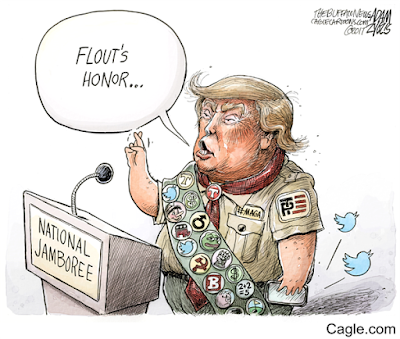 The Boy Scouts is an organization that inculcates high ethical standards in its young members, and they got an earful at their national jamboree from a President who some Senators think may be deranged. The question of his sanity aside, his disjointed talk--it was not worthy of being labeled a speech--was the epitome of ribald innuendo, misplaced hero worship, and rampant egotism on display. As 'Merica attempts to deal with the train wreck that is his administration, the North Koreans tested an ICBM that has the range to reach Los Angeles. Reality trumps the chaotic psycho-drama in Washington once again.